Bright red flowers emerge in the spring on Autumn Bonfire™ Encore® Azalea - Rhododendron ‘Robleza’ PPIP. With semi double flowers measuring 2.5" across, this colorful display will make it stand out and demand you pay attention to it. With an™ Encore® presentation in the summer, this azalea will be a stunner the entire year. When it’s not flowering, the dark green leaves will provide a fantastic backdrop all year round – including in the winter. 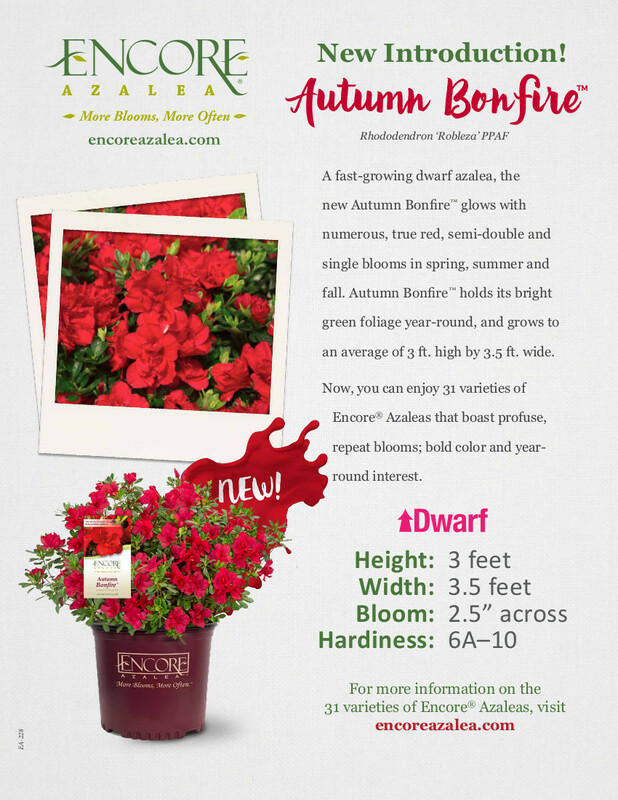 The Autumn Bonfire™ Encore® Azalea was added to the Autumn™ Encore® collection in 2017. Don't let this dwarfing azalea fool you, it packs a punch full of red beautiful flowers! Plant your Autumn Bonfire™ Encore® Azalea in well-drained soil. Mulch and water until established. Though often not required, prune in the spring after flowering. To establish an informal hedge or foundational planting, space Autumn Bonfire™ Encore® Azalea at least 5 feet apart center-to- center. For a more formal hedge, plant 3 to 4 feet apart on center. I have a red flower garden and thought these would be a perfect addition to it. I live in zone 7, and the plants are doing absolutely great so far, and fit right in with my other red flowering shrubs. I love the red flowers. Just wish I could cut them into arrangements easier. But they look beautiful in my garden! These were much smaller in the mail. For what I paid in shipping I expected these to be larger. They were healthy though, so that's why I give it 3 stars instead of 1. This is such a great addition for my garden. The plant arrived really healthy and within a week of purchasing. I'll definitely be ordering from you again! Especially if I can get points every time I do order...I can't wait to earn a free plant. I'll be so excited for that! I just planted this year, and they are already blooming! These red flowers are sooooooo pretty! I ordered 1 of these to see what would happen. I've never heard of this website before, so I wanted to test it out before making a bigger purchase. I couldn't be happier! I ordered the azalea on Friday and it was at my door on Tuesday. I was given the tracking number so I could see exactly when to expect it to arrive. The plant was in great shape as well, and is currently doing great in my garden. I'll definitely be ordering from plant addicts again!